These helped a lot, keeping the wind from rushing through the mesh on the shoes near the toe area. But, the covers just wouldn’t stay on. I should point out, I’m trail riding on a mountain bike, not road riding, so I have cause to put my foot down here and there and more often than not this would just push the cover right off the toe. I think if you were road riding, they’d stay on with no issue. But, for me, riding in the trees on icy, snowy single-track trails, I couldn’t keep them on, and so, after a while I’d still end up with cold feet anyway. I figured I either needed to get way better at staying on my bike, or invest in something else. Some of the folks I ride with where wearing the whole bootie cover, and that seemed like the solution to me. A zip-up, insulated and wind-proof shell that goes over your whole shoe – perfect! But, not so fast. Everyone was having trouble keeping them on too, and for the same reason – the toe would slip off after any pushing, or hike-a-bike. 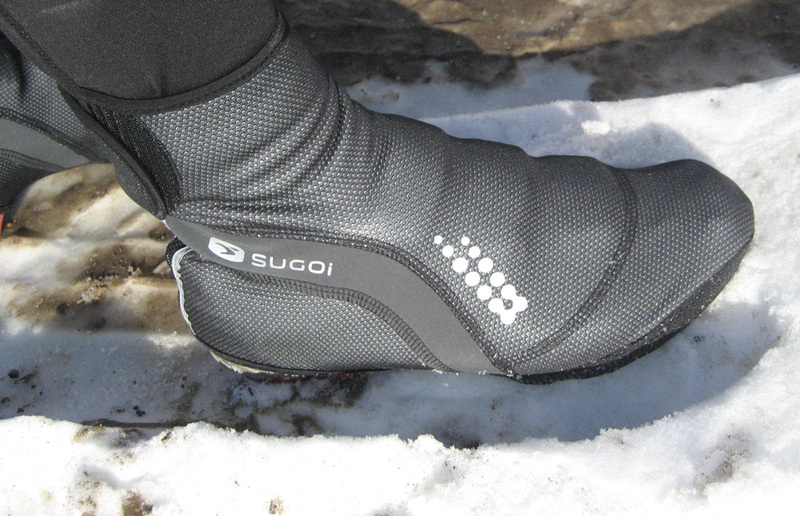 I’ll point out here that three of the people I ride with were wearing the Sugoi Resistor Bootie – the one with the yellow toe strap. I still figured I wanted to graduate to the bootie, but wasn’t too keen on the Sugoi ones given how poorly they were staying on for the riders I knew. It was only about a week later that I was at River Valley Cycle and I asked the crew there what other kinds of booties might be any better. Jarrid looked at me for second and said, ‘hold on a minute. I have some new ones for you to try.’ He came back out with a newer version of the Sugoi Resister. ‘Here you go. They’re the wrong size for me. Try these out.’ Sweet! When I got home, I fought with them for a good 20 mins just to get them on my shoes. These booties were size ‘large’, and I wear is a size 10.5 shoe. For a while, I figured they weren’t going to fit. But, with some stubborn determination, I got them on and that Sunday I headed out. Right away I was cautiously confident that they’d at least be a little better at staying on. The toe cover is more robust, and the fabric bridge that runs under the arch of your shoe is also a little beefier then the previous incarnation. And so, after 2 hours of trail riding, push-offs, and even a run up or two, they held on without issue. And on top of that, they were super warm, at least in temps from -2 t0 -10 degrees celsius or so. I haven’t tried them out in really cold weather yet, but yeah, so far so good. A potential downside though, is that the new ones are more ‘fibrous’ or mesh-like on the outside. This allows them to be more form fitted, and fit more snugly, but I can see this possibly being less durable than the other bootie, which had a seemingly ‘tougher’ exterior. That said, I’ve been out on two solid rides now and can’t see any wear or tear. Verdict: New Sugoi Resistor bootie – GOLD! Nice, they look quite a bit more substantial than the Resistor that I have (ie. yellow toe/heel). Which is good. I also had the problem with the toes coming off during hike-a-bike sections, but to be honest I think the construction on the old resistors is a little shoddy. I’ve only been wearing them for the winter (and mostly for commuting – ie. rarely getting off the bike) and they’re already starting to fray and come apart at the seams. This is in stark contrast to most of my Sugoi stuff which has been holding up really well. Let’s hope the new boot holds up better. With that said, tho, if you’re going to get seriously into winter riding a bunch of people in Calgary picked up some actual winter biking shoes and they said you can’t even compare them to a shoe/bootie combo (like the Specialized Defroster). Completely impervious to everything from what I hear. first of all, nice review. The Sugoi Resistor Bootie were a very big disappointment. it seems that Sugoi is listing to its customers concerns. My old Resistors did night even last one season. The new seemed to have solved the problem of the toe slip off. but i would be interested to see their long term durability as my old resistors did not even last 5 rides. it is my understanding that the new resistor booties are not on the market yet. 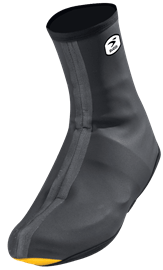 for those of you who are looking to get back in the bike right now, I strongly recommend the booties made by gore bikes wear. I been riding them for this season and they have been awesome. easy to put on and remove. they stay in place and they show no signs for deterioration thus far. the only down side, they are $$$. you might as well put a few more bucks in and get your self some actual winter riding shoes (save your racing shoes for the summer). Lake makes some awesome ones.